> Washington, D.C. – U.S. Senator Pat Toomey (R-Pa.) is defending property rights, a growing economy, and middle-class Americans from a recent proposal by Senators Bernie Sanders (I-Vt.) and Chuck Schumer (D-N.Y.) that would severely restrict the ability of American companies to buy back their own stock. 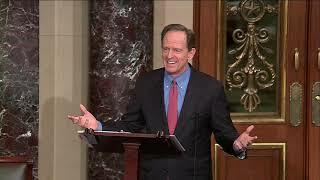 > Senator Toomey’s remarks, as delivered, are below. > “Thank you Mr. President, I rise to address two economic issues this evening. > “The first is a reaction to a proposal that comes to us from our colleagues on the other side of the aisle But let me preface this, Mr. President, with the observation that I’m pretty sure we are living through the strongest economy in the United States in my adult lifetime. It’s been fantastic for the people that I represent. Our unemployment rate is pretty much at a 50-year low. African-American and Hispanic unemployment; the lowest since it’s ever been recorded. Youth unemployment rate; extremely low, historically low levels. Our economy has accelerated wages are growing exactly as we said they would. And it’s very simple the demand for workers has grown so much that employers are being forced to bid ever higher for the services of the workers. And now, we’re in a tremendously enviable position of having more job openings in America than there are people looking for work in America. It’s fantastic. This is exactly what we want to have happen and the President was right when he said last week that our economy is the envy of the world. Totally true. > “So what do our colleagues on the other side of the aisle do to propose do in light of the fact that we have this fantastic economy? Well Senator Sanders and Senator Schumer joined up and have made a proposal that we adopt legislation that would severely restrict the ability of America companies to buy back their own stock. > “Mr. President this is just the latest iteration of a socialist tendency that seems to be growing on the far left. This idea is a horrendous idea. I suppose we shouldn’t be surprised when we hear a socialist leaning idea coming from a self-described Democratic Socialist or social democrat – whatever description is. But I am surprised to hear this coming from the Senate Minority Leader. > “So let’s talk about this a little bit. First of all what is a stock buyback? It’s not that complicate. It’s when the owners of a company take some or all of their money out of the company. Alright, so let’s think about it this way, a business is owned by its shareholders and the shareholders hire a management team to take their money and invest it in a way that will generate a return for the investors, for the shareholder. That’s the role of the management team. So why would they buy back their own stock? Well the reason they would buy back their own stock is because sometimes it happens that the management team of a company is just not able to deploy any more capital in a way that would generate a better return than what is generally available in the marketplace. So what happens sometimes is companies might make huge investments. They may be investing tremendous, record amount in expanding their capabilities, expanding their production, more R&D, expanding their staff. But they can reach a limit to how much they can expand, how much they can productively invest at any given point in time and if they’ve got more money, more cash than they can productively deploy, they’ve got an obligation to return that to the people who actually own it, which is the shareholders, the investors. That’s their obligation and shockingly Senators Sanders and Schumer are suggesting that companies be forbidden from being able to return some portion of their excess capital to their shareholders unless the company first complies with the list of political demands that Senators Schumer and Sanders are advocating. > “Let me walk through why this is such a bad idea, Mr. President. I’ll give you three reasons. One it is a very disturbing and profound attack on freedom. Number two would be terrible for the economy. And number three, it would hurt the very people that presumably they intend to help. Let me go through them in order. > “First of all, as far as freedom goes, whose company is it? To whom does this company belong? Well a given company in America, I’ve always thought they belong to the shareholders of those companies the people who saved up and invested in them. The people who launched those companies. The people whose capital made it possible. So of course it should be within the rights of the people who own this company to decide what to do with the profits after all expenses have been covered and taxes have been paid. That’s what we’re talking about here. And I have a question for my colleagues. And the question is what principle confers on politicians the right to control whether and when and under what circumstances an investor can withdraw his own money from a business in which he invested? I don’t know what that principle is. I will say it seems exactly equivalent to me to confiscating the property of somebody, in this case their ownership in a business, and redistributing that confiscated asset to whoever they choose. That strikes me is pretty close to the definition of socialism, Mr. President. So it’s clearly an attack on the economic freedom that underpins our entire economy, an entire market economy. > “Second point and related is this would be terrible for the economy. It would do great harm to an economy that is, right now, doing quite well. And the main way that it would be so damaging is it would scare away capital. You just stop and think about it, our economy thrives when people are willing to invest in existing businesses, in new business, in startup businesses but that investment is an absolutely essential part of a thriving economy. > “Well people are much less likely to make an investment if Congress makes it harder to take that investment out. So what we would do is we would dry up sources of capital for companies that need that capital because investors would understandably say “well we’re heading down the road of putting all kinds of limits on my ability to ever get my money out. I think may be good to just park it and not invest in.” That’d be a very bad development. The proponents of this idea of restricting companies this way they say they want to and this is a quote they want to incentivize productive investment. I have to laugh because I have a secret for our colleagues. You see the free enterprise system already provides an incentive for productive investment it’s called a profit. It’s like the whole idea. So we don’t need to punish people for making an investment as a way to incentivize productive investment. In fact it won’t work at all. > “Now, I think, some of what they’ve argued displays a little bit of confusion about how this works. In their argument about why something has to be done here, they say that 90 percent of profits go to buybacks and dividends. What else would you use it for? I mean you first have to cover all your expenses before you have a profit and so you could have record amounts of research and development, record amounts of expansion, record amounts of employment, and growth in employment. After all of that is covered, only then do you have the profit. That’s what’s left over and after you’ve covered all of those things why wouldn’t you have buybacks and a distribution to the investors. > “And that raises the question of exactly what problem is it that our colleagues think they’re solving here? We are running at record high levels of investment in our economy. Capital expenditures has gone through the roof in response, partly, largely to the change in the tax law that we made. So the buybacks that have been occurring have coincided with record levels of investment. What’s the problem here? Oh, and by the way, as I pointed out earlier, wages and growth have accelerated at the highest rate that we’ve seen in many, many years. I really don’t understand what problem they think they’re solving. And by the way, there’s an alternative to distributing excess capital to shareholders. The alternative is keeping the capital trapped in the company, where it is not being put to its most productive use. See, one of the great dynamics of a market economy is by returning excess capital to shareholders, the shareholders get to decide what new idea deserves to be funded. By recycling this capital, whether it’s in the form of dividends or stock buybacks, we encourage this capital to find a new home, a new startup, a new idea, expansion of an existing business. It’s the capital is constantly being redirected to the best ideas as long as you allow it to happen. > “Finally Mr. President, this idea would be very harmful to the people that it’s presumably meant to help. You know about 40% of all equities in the U.S. are held in pension and retirement accounts. These are the accounts of teachers and cab drivers and truck drivers and folks who work at factories and do every other job that our economy depends on who put a little money away. It’s in a 401k plan or it’s in an IRA or it’s in an employer-sponsored pension plan. These folks own an awful lot of the stock in America. Well buybacks are good for their investment because, in some cases, it returns cash that can then be redeployed. In other cases it provides a bid, it provides some upward pressure on the stock price which is good for the value of their savings, and over time if the stock gets retired then the diminished supply gets that much greater a share of all the future earnings. This is completely win-win for savers and investors. Want to win in November? Save voters from Obamazoning. Does Congress matter? Commerce Dept. reviews Internet giveaway proposal lawmakers prohibited.